This generative poetry workshop will focus on listening, looking and gathering. We will investigate how we record when we write and how we write when we gather language from the outside. We will try found poetry and collaborative writing experiments. Expect to start many poems and finish none. Bring pad and pen or pencil. Open to writers at all levels. 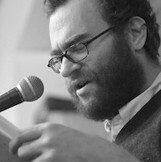 Joshua Beckman is the author of nine books, including The Inside of an Apple (Wave Books, 2013), Take It, Shake, Your Time Has Come, and two collaborations with Matthew Rohrer. He is an editor at Wave Books and has translated numerous works of poetry and prose, including Micrograms, by Jorge Carrera Andrade, 5 Meters of Poems (Ugly Duckling Presse, 2010) by Carlos Oquendo de Amat and Poker (Ugly Duckling Presse, 2008) by Tomaž Šalamun, which was a finalist for the PEN America Poetry in Translation Award. Participants who register for this class will receive a complimentary copy of Beckman’s new book, The Inside of An Apple. In addition, at 7:00 p.m. on November 10th, Joshua Beckman will be joined by John Beer and Zachary Schomburg for a reading at Literary Arts. This event is free and open to the public.